BMEC Band Nights are back! BMEC Band Nights occur roughly every two months in the BMEC City Hall. They are a relaxed and enjoyable evening supporting regional musicians performing original contemporary music. They are also an opportunity for BMEC and the community to support some amazing emerging young artists who appear as supports. Simple and affordable food is available, the bar is open and the dance floor awaits. The next BMEC Band Night is Friday 17 May and the headline band will be the Tipsy Scholars. 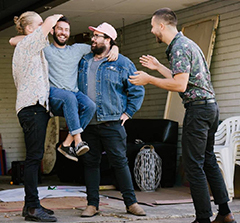 Since the band’s inception in 2014, there has been an organic camaraderie between the four members who met at The Australian National University in Canberra. Having moved from their respective towns of Bathurst and Sydney, the group developed a strong bond through their shared love for music, something that is visible every time The Tipsy Scholars step on stage together.